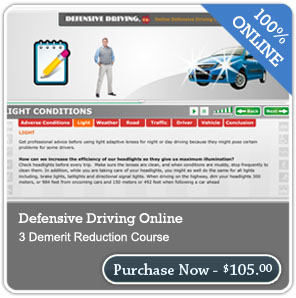 The first online program in Alberta to grant successful graduates a 3 demerit reduction from their license. Some insurance companies give a reduction in rates to course-participants. Why spend six hours in a classroom taking a defensive driving course when you can spend the time in the comfort of your own home? Our program is interactive, has great videos, humorous graphics and informative content. Online learning is about you, as well as the ability to meet your needs on your schedule. A powerful 2 - 3 hour course. Not a 3 demerit reduction course. A program designed specifically for professional truck drivers. Driver lessons and techniques to avoid driving while fatigued. NSC Standard 10 Cargo Securement approved training course for drivers. Understand fatigue and the strategies to combat it in your organization. Learn winter driving skills and strategies. Reinforces good driving habits and behaviours. Does your organization require training for it's employees or your fleet? Do you need to be able to report on employee progress or training records? Corporate accounts are also available. This is a very "Eye Opening" course. I never looked at the way I drive in this way before. This course is awesome and improved my driving a lot. I think this course should be mandatory for every driver in the city. This course was great. Thanks.